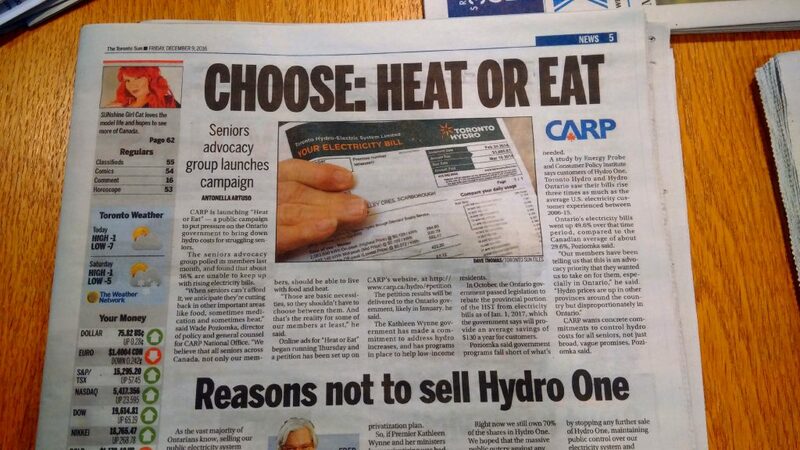 CARP is launching “Heat or Eat” — a public campaign to put pressure on the Ontario government to bring down hydro costs for struggling seniors. The seniors advocacy group polled its members last month, and found that about 36% are unable to keep up with rising electricity bills. “When seniors can’t afford it, we anticipate they’re cutting back in other important areas like food, sometimes medication and sometimes heat,” said Wade Poziomka, director of policy and general counsel for CARP National Office. “We believe that all seniors across Canada, not only our members, should be able to live with food and heat. “Those are basic necessities, so they shouldn’t have to choose between them. And that’s the reality for some of our members at least,” he said. The petition results will be delivered to the Ontario government, likely in January, he said. The Kathleen Wynne government has made a commitment to address hydro increases, and has programs in place to help low-income residents. In October, the Ontario government passed legislation to rebate the provincial portion of the HST from electricity bills as of Jan. 1, 2017, which the government says will provide an average savings of $130 a year for customers. Poziomka said government programs fall short of what’s needed. A study by Energy Probe and Consumer Policy Institute says customers of Hydro One, Toronto Hydro and Hydro Ontario saw their bills rise three times as much as the average U.S. electricity customer experienced between 2006-15. Ontario’s electricity bills went up 49.6% over that time period, compared to the Canadian average of about 29.6%, Poziomka said. CARP wants concrete commitments to control hydro costs for all seniors, not just broad, vague promises, Poziomka said. Find out about CARP’s Hydro Initiatives and Sign the Petition today!